← #AdventBotany Day 3: was the ‘golden apple of discord’ a quince? Botanists are no strangers to muddy boots. Glastonbury conjures up an image today of muddy wellingtons at its famous pop music festival. The town also possesses a unique botanical heritage with a strong Christmas connection. Glastonbury is located on the Somerset Levels in England. It is steeped in ancient myths and has a tumultuous history. Today, the town is a unique spiritual centre that recognises and acknowledges all faiths and religions. Separating fact from fiction is impossible in Glastonbury. The Glastonbury Thorn suggests that there is some fact amid all the myths. 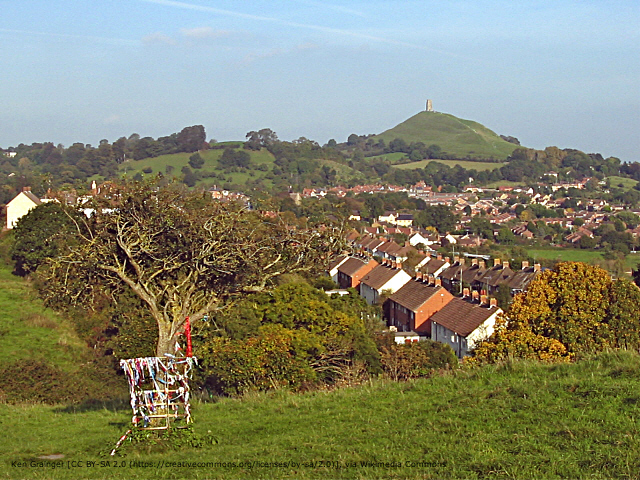 Legend claims that following Christ’s crucifixion, his uncle came to Glastonbury. Joseph of Arimathea was weary after his long journey. He thrust his staff into the ground on Wearyall Hill. It took root in the ground, developed into a tree and flourished. During the English Civil War between 1642 and 1651, the Thorn was regarded as an ancient superstition. One of Oliver Cromwell’s soldiers cut down the original Glastonbury Thorn with an axe. Legend suggests that one of its thorns blinded the solider in one eye. A sprig of the Glastonbury Thorn’s winter blossom has been presented to the British monarch every Christmas for centuries. The Glastonbury Thorn is a variety of Hawthorn called Crataegus monogyna var. biflora. Biflora refers to its unique characteristic of flowering twice a year – once in spring and again in winter. Intriguingly, it is not a native British Hawthorn. It originates from the Middle East. Is there an element of truth in the legend? The Glastonbury Thorn will not grow from seeds or cuttings. It can only be grafted onto Crataegus monogyna, the Common Hawthorn. 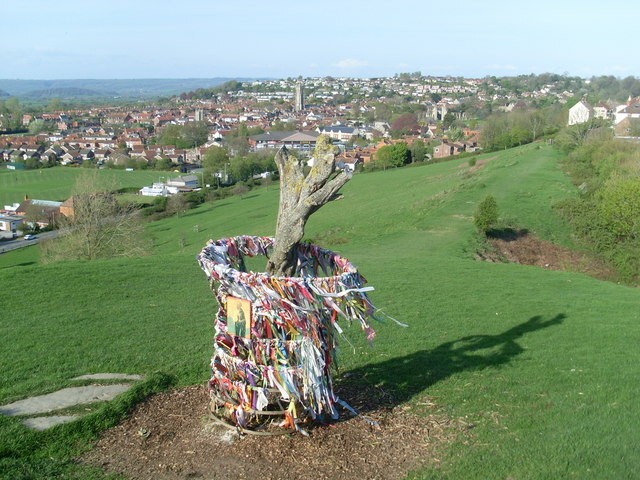 Each Glastonbury Thorn only lives for around 100 years. Its descendants have survived through the centuries – including the Henry VIII’s Dissolution of the Monasteries which left Glastonbury Abbey in ruins. Situated on Wearyall Hill, this tree is said to have sprung from the staff of Joseph of Arimathea, the man who took Jesus’ body from the cross and placed it in a tomb. The staff subsequently became a thorn tree and has been a natural shrine for Christians across Europe. However, in December 2010, it was vandalised with its branches lopped off. Hopefully, the tree will grow again in the years to come. The town of Glastonbury can be seen behind the tree. © Copyright David Hillas and licensed for reuse under CC BY-SA 2.0. The tree on Wearyall Hill with Glastonbury Tor in the background. Disaster struck on Wearyall Hill in 2010. The iconic tree was vandalised with a chainsaw. The local population was outraged and devastated. The Royal Botanic Gardens, Kew came to the rescue with a new, grafted tree. Unfortunately, that tree was vandalised too. Glastonbury’s residents were not to be defeated. They replanted. Today, the Glastonbury Thorn lives on protected in local gardens and other sites in the town, as well as at selected sites across the country. The tree’s resurrection underlines the important role of botanic gardens in protecting the world’s endangered plants. The Glastonbury Thorn’s comeback offers a Christmas message of hope for the survival of other threatened species. Holy Thorn tree, Glastonbury © Copyright David Hillas and licensed for reuse under this Creative Commons Licence. This entry was posted in Advent, MSc Plant Diversity, Public Engagement with Science and tagged #AdventBotany, #MScPlDiv, Glastonbury Thorn, MSc Plant Diversity. Bookmark the permalink.